…Well not actually doing the building work obviously. I have trouble putting shelves up these days, but we are funding another school in Cameroon in partnership with the charity Building Schools For Africa. 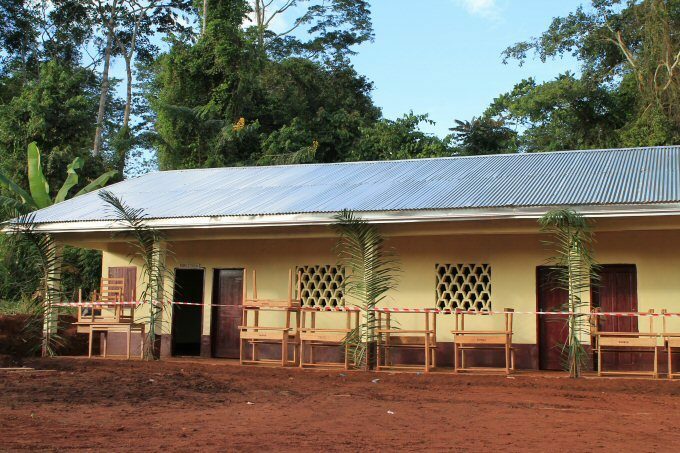 If you read my blog a lot you might know that we already built a school in Cameroon a while back. Here is the last blog post about it. Its pretty transformational when you look at what the school looked like before (basically a shack) and how awesome it looks afterwards. Our reason for doing this remains the same. Education is a good thing, and there are still too many people in the world who don’t have access to it. Education helps lift people out of poverty, and is a pre-condition for a modern democracy. I was lucky enough to be born in England, not into any money whatsoever (far from it), but nevertheless in a country where I would always be housed, and have food, clean water, education and safety. I understand why people give to local charities, or charities that are working on problems they have personally experienced or are deeply connected to, but personally I find it unusually easy to detach myself from considerations such as ‘people like me’ and ‘my country’ and think more about ‘who needs help’ and ‘whats the most impact my donation can make’. I don’t know of any charity in the south west of the UK that could affect as many peoples lives with such dramatic effect as building an entire school in Cameroon would, for the same money. It also doesn’t bother me that I probably will never see the school, or meet anyone who goes to it. I’m unusual like that, so I’m in a good position to do this. Lets not gloss over the latrine and hand-washing facilities too quickly. Hopefully this will mean better educated AND healthier kids. The total cost to positech is £23,967 (approximately $33,000). 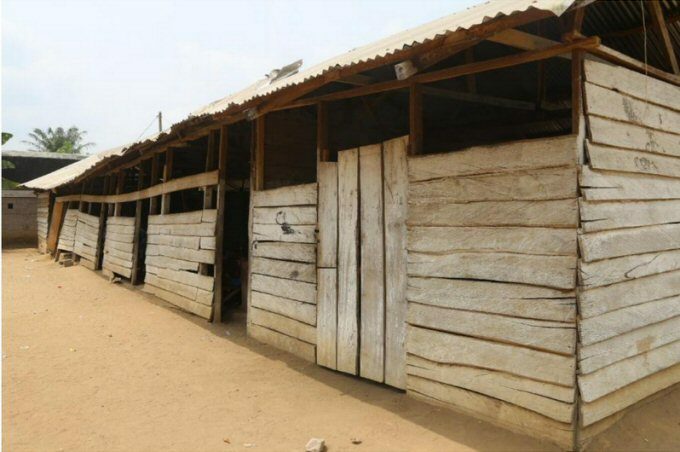 The school is in Muyuka in Cameroon, population 34,000. Like last time, I offer the disclaimer that although these blog posts can read a bit ‘ooh aren’t we wonderful’, I do them mainly to provide information and encourage others to get involved too, and I know thats happened at least once. Positech Games is a bizarrely successful games company, and I feel very lucky to be in a position where we can do stuff like this. Big thanks to everyone who has continued to buy our games and make this sort of thing possible. You rock. Is the vive pro worth the upgrade? A long time ago I was one of the lucky few who got an early VIVE headset from valve, then eventually got a VIVE pre (basically the release model, sans bluetooth support in lighthouse). I considered developing a VR game quite seriously, and spent a lot of time with the original VIVE headset. We even hosted a village VR party to introduce all our neighbours to its wonders which was interesting and fun, as the average age of my neighbours is HIGH. They all loved it. In the end I didn’t release a VR game (my 3D skills are weak and I detest unity), but I remain a believer in consumer VR, and got a lot of use out of ‘fitness’ apps like rhythm punching games, and various VR archery and sword-related games. I even smashed my office lighting fixture to smithereens when playing vanishing realms. I recently shelled out the £799 for the upgraded headset. This is a business expense for me (so knock off 20% tax saving) and also I’m VAT registered and can reclaim, so knock off another 20%. I got it yesterday, and played with it with a few games and experiences like ‘the blu’ here are my impressions. 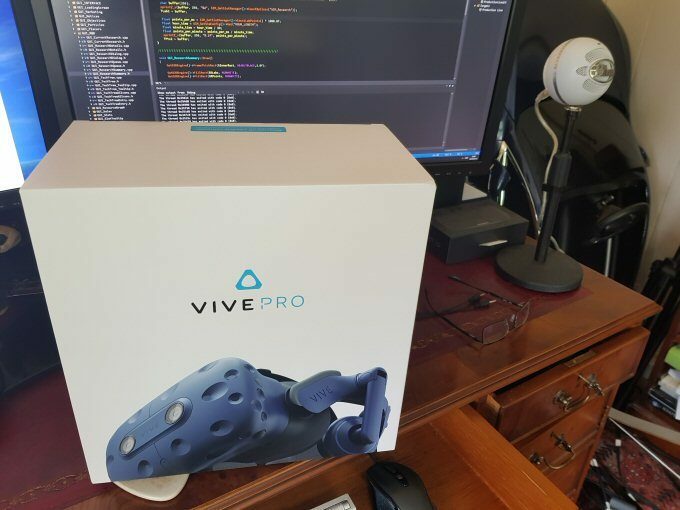 The VIVE pro comes in a nice compact box, nothing too ridiculous, which makes a pleasant change. 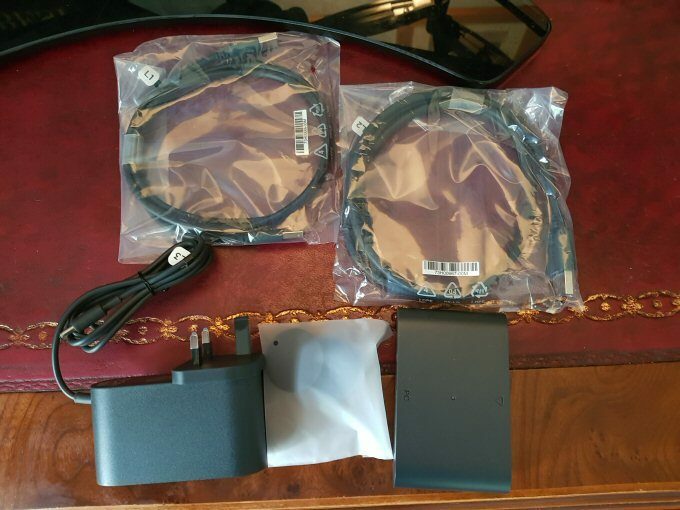 Inside is a box for the headset and a box for the other stuff they updated, which is essentially the ‘breakout box’ and its power adaptor, and the various leads you might need to connect stuff. The breakout box now has a power status LED and a power on/off button, both of which were obvious fixes from the bare bones original. I find it practical now for me to leave it permanently plugged in, knowing I can actually turn it off with a simple button press. This might seem a minor thing but actually its a BIG deal, my number one problem with the original VIVE setup was the fact that it took such a LONG sequence of actions to set up your VIVE to play a game or get some exercise. The barrier to entry meant I used it way less than I would otherwise. Firstly, YES, it does have headphones integrated now, and this is a huge win. I’ll be honest, I like a decent pair of headphones and these are not decent, they are relatively cheap, with very poor bass response, and not a patch on the headphones I normally use for gaming, or my old bose ones. However, the fact that they are integrated and zero hassle, and mean one less cable, is a HUGE win. The adjustment on them is a bit limited, and I had to fiddle with various positions of straps etc to get them fully and nicely over my ears. More range of adjustment on these would be an improvement worth making. The biggest change for me is the ergonomics of the headset itself. Firstly somehow there is now ZERO peripheral vision. With the old vive I could sometimes look down past my nose and see the floor, not any more, you are 100% in the dark with the vive lenses your only vision. This is a vast improvement. Secondly, and I’d argue even better, is that instead of assing around with some unreliable Velcro nonsense at the side of your head, the new VIVE has a sort of ‘screw’ at the back of the head which can neatly and nicely tighten or release the whole headset. It works REALLY well, and my only gripe is that they haven’t taken the same approach on the top adjustment, which remains Velcro. Thirdly, the higher screen res now has (for me at least) 100% eliminated this ‘screen door’ thing that people mention, which is the fact that you can effectively see rows of pixels which break immersion. Those are just GONE now, and that is going to improve the feeling of ‘being there’ quite dramatically. Finally, the headset now has a SINGLE cable (I think the original had 3, including headphones), and this is vastly better, plus the headset itself feels lighter. In short, its much more practical, comfortable and feels more like finished consumer hardware and not a prototype any more. So should you get one? Well for me, its definitely worth it, given that I’m relatively cash-rich/time-poor and hated messing around with cables and buttons and so-on every time I wanted to use my VR headset. I also dont pay the VAT and can expense it, remember. If you have the VIVE already, upgrading to this may seem pretty expensive, and all I can say is that when people bang on about the screen res or headphones, dont disregard the fact that its a huge ergonomic upgrade too. 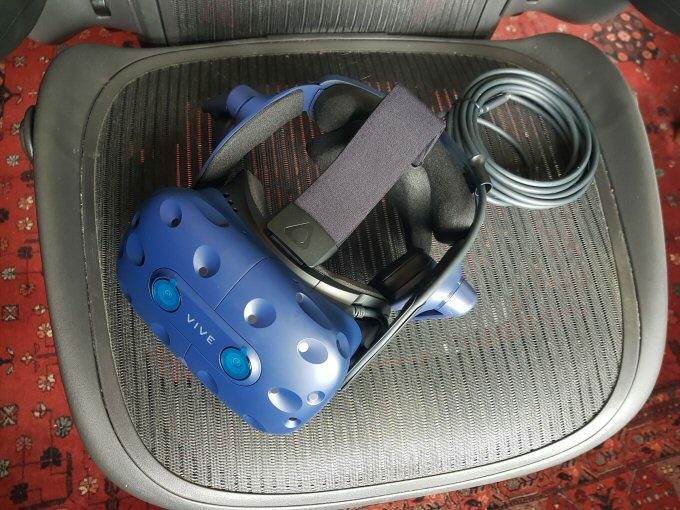 If you love your VIVE but find it a pain to use, this is definitely a big improvement for you. If you want a step-=change in VR immersion, it probably is not. What I would say is that if you dont have ANY VR setup yet, and are trying to decide between the original and the pro, I’d definitely recommend the pro as worth spending more on. Time will tell if I’m still using it a lot in six months time, but so far I’m impressed and glad I got it. 1) [BUG] AI rivals now correctly check they have researched pre-requisites for a tech before researching that tech. 2) [Bug] Marketing achievement now correctly triggers at $5million, not $1million. 3) [Bug] Finance summary screen now ignores the current hour for calculating lifetime results, so it is consistent with reporting in the other columns. 4) [GUI] Left-clicking on a blueprint now brings up a menu allowing you to move, delete or buy that individual blueprint (if unlocked and affordable). 5) [GUI] Blueprint layouts are now saved and loaded within savegames. 6) [GUI] Features & components windows now moved to be part of the general efficiency window, and component chart redesigned so it shows production and consumption more sensibly. 7) [Balance] Customers now have a wider potential price range they are interested in, but base number of customers per hour has been reduced, so you run out of customers more quickly. 8) [Balance] Marketing campaign effects on brand awareness are now not as persistent as before. 9) [GUI] Breakdown of where customers come from now added to tooltip on market screen customers indicator. 10) [GUI] Redesigned main menu screens. 11) [Bug] Fixed crash bug when placing down a smart junction blueprint, converting it to a proper slot, then saving the game. 12) [Feature] New facility: Half size (mini) supply stockpile! 13) [Balance] Major changes to the costs of the different marketing campaigns. 14) [GUI] Marketing campaign progress now shown in marketing menu buttons tooltip. 15) [Balance] Make door panels, roof and steering wheel slots now takes twice as long but outputs 2 at a time, to reduce resource importer requirements. 16) [Balance] Make aircon power costs raised and production line raised, but output doubled. 17) [Balance] Make exhaust production time increased but output doubled. 18) [Balance] Slowed down production rate of make wheels slot, added more employees and boosted power demand. 19) [Balance] Increased build cost and process time of manufacture rollcage slot, but doubled its output. 20) [Balance] Reduced process time of manufacturing airbags. 21) [Balance] Increased construction cost of make exhaust slot and added 4 new employees to the slot. 22) [Content] Added 16 more car company logos to choose from. 23) [GUI] Archived designs no longer show up in the smart junction design GUI. 24) [Feature] New defect system, new rework station (and research requirement). Visual inspection slots can be placed anywhere, defects affect sales probability, based on new perceived brand quality metric. 25) [Bug] Fixed potential crash on car showroom screen. 26) [GUI] Slot picker now shows more sensible information on research office point generation. …so! basically we have a lot of improvements to the blueprints system, new researchable mini supply stockpiles, plus a completely new defects system. The defects system needs some GUI improvements, and a tutorial and updates to the steam guide, and I will be working on all that sort of thing over the next week. It will probably require some balancing as well. Also note that we have made a bunch of balance changes to make it much more practical to produce components ‘in-house’ in this build. This turned into a bigger than expected update because after doing all the requested blueprint improvements, I started work on defects, and then while that was being done, 16 new company logos showed up from the GUI artist, so its all been lumped into one feature and content heavy update, which is kinda cool. I really need to get working on tutorial stuff so the defects system is not confusing. I really like the way its working, but obviously I understand how it works, and its not that obvious to new players of the game yet. As usual, I need to beg any players of the game who have not yet done so to review it on steam. Go to your page for the game in the steam client, and look for the ‘write review’ text on the right hand side (under LINKS). Its much appreciated. We had this theory back then, that if you can propel your game into the charts, its position in the charts would become self sustaining. It was a ‘fake it til you make it’ approach to marketing. It turns out, that back then, you absolutely could get any game you wanted into the charts (not #500, but #5, #10 etc) if you just spent enough money on adverts. So thats what we did. At one point I was spending $700 a day on ads, and earning $1,300 a day in sales. awesome. So we raised it. We hit $1,400 a day on ads and $1,638 in sales… Not so awesome, but maybe a road-bump. We had a hilarious day where we spent $2,300 on ads and earned $2,394 in income… hmmm. Then we had a few days where we lost money whilst spending $2,300 in ads. And I panicked, and I stopped, and very rapidly the game dropped like a stone from the charts and all was forgotten. However…in the long run things did ok. Democracy 3 has made $80k profit(ish) on itunes (That includes all the DLC), which is pretty good. Thats after the porting cost (I didn’t do it myself) and all the ad deductions. But anyway.. my point is that I think the inertia strategy *can* work, but its REALLY hard to get it right, because you have to fight INCREDIBLE human pressure to go ‘holy crap. HOW MUCH on ads?’ especially after release when you were really hoping to finally be earning money, not spending it. Most indies dont spend anything on actual paid promotion at launch, relying on the odd tweet or maybe a cool video (which nobody watches), so persuading them to try a crazy strategy like maybe actually LOSING money in the first month of release due to a massive ad spend is probably an incredibly hard sell, even to me (I’ve never gone that crazy). But still at the back of my mind, I think its a winning strategy. Success *does* become self sustaining. I’ve heard a lot about PUBG, Fortnite and Getting Over it, because everyone is talking about them. Everyone is playing them because… everyone is playing them. Obviously they have to be good games too, thats a given but I am talking about the effects of a certain level of success becoming self-sustaining. Think about new movie releases, especially the big budget ones. Some of these will lose money, but none of the studios act like they will lose money during launch week. Its all billboards, billboards, TV ads* and Web banner ads pimping the latest smash hit! You only find out that the movie lost $10 million years later if its mentioned in some studio financial report. Fake it till you make it. A lot of people thought steamspy was a great way to tell if a game made loads of money or not, but there is no insight into the development and marketing cost of those titles. Some games that made $1million in sales probably made $900k profit. Some probably lost $1million overall. 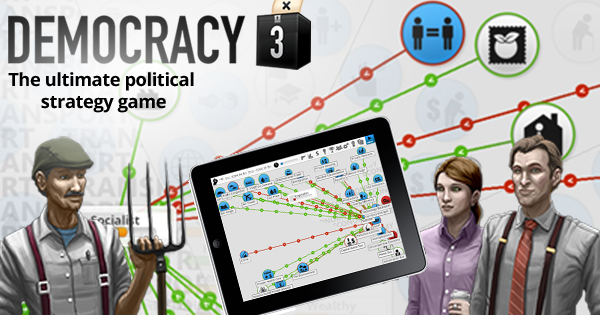 FWIW, with my biggest selling game (Democracy 3), Marketing represented 6.7% of total profit, and 5.47% of total revenue. With Production Line, that percentage will be way higher (roughly 30% of profit), partly due to changes in the marketplace, partly due to PL still being in Early Access, so still having untapped ‘stored value’ and it not having a long tail yet. My goal is to teach myself (and really believe it), that the percentage of your total revenue that goes on promotion and development is not the issue, this is just ‘cost of sales’. The goal, from a business POV is as high a profit as possible. if you have to spend $900k to bring in $1,100k, thats still way better than spending $0 and bringing in $100k. Its just much, MUCH scarier.